Bob Doman's thoughts on thinking and human development. Let’s just install ceiling fans in every classroom. Fidget spinners—what a wonderful invention—as though our children need something else to distract them. Let’s give children mini ceiling fans to carry around to help them pay attention—what a great idea! If spinning things help children concentrate, let’s just install ceiling fans in every classroom. I have been arguing against giving kids on the Autism Spectrum fidgets for years. Do some kids on the spectrum like and want fidgets? Absolutely—they’re addicted to them. A fidget feeds their sensory addictions and helps keep them seated in their classroom chair when what is being presented quite possibly doesn’t fit them and goes on way past their auditory attention span. You attend to what you can process and if the input doesn’t fit your ability to process the information or what is being presented doesn’t match your knowledge/educational base, then you don’t pay attention to it (sadly this describes most children in most classrooms). Unfortunately, the operational definition of educational inclusion for children with developmental problems has really just come down to the kids sitting in desks and not making a fuss while surrounded by typical children. The special needs children then leave the classroom for a resource room where the instruction is hopefully more targeted and appropriate for the child. So, enter the fidget. The theory is that the fidgets help the children on the spectrum pay attention and avoid being distracted. As far as I know, there has been no good research to substantiate this, but I would suspect that if the research were directed at whether a fidget would keep a child sitting for longer periods the results would quite likely be positive. If, however, the study was testing whether the children learned more or if it helped their sensory issues, I believe the answer would be no. There has, however, been extensive research on the effects of any and all distractions while driving (paying attention) and the conclusion is that they are all bad. Try driving and watching your fidget spinner spin. You can give it another twirl if it stops and tell me if it makes you a safer driver. 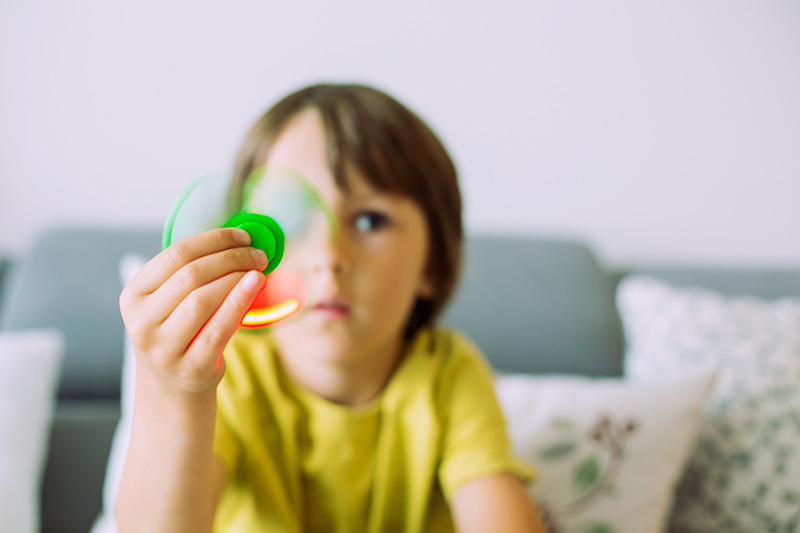 One of the first things we recommend parents who have children on the spectrum do for their children who engage in visual DSAs (Debilitating Sensory Addictive behaviors), is to remove or a least not turn on any ceiling fans. As most parents with children on the spectrum with visual issues know, the kids will stare at ceiling fans endlessly if given the opportunity. None of these parents will tell you that their child is paying better attention or is more present while staring at the fan. The fan takes them away—it doesn’t help them focus or concentrate. Most visual stims or DSAs involve the child playing with and stimming with their peripheral vision. Your peripheral vision picks up movement and edges, both of which are stimulated in a negative fashion by ceiling fans, fidgets, waving fingers, staring at edges, etc. Fidget spinners not only distract with the visual aspect, but also with an audio and a tactile component—they hum and vibrate while they spin. So let’s have the child’s brain distracted with extraneous visual, auditory and tactile garbage and simultaneously help build a new addiction. I’m sure to hear from “professionals” out there, particularly occupational therapists who just discovered that children have sensory issues, but having worked with Autistic children for fifty years and having learned how to help normalize their sensory issues, I am confident that feeding their addictions is not in their best interest in the long term. If the motivation and goal is to keep them content, in their seats and quiet at the cost of their development, then. . .
Now, enter the logic that begins with the erroneous premise that if fidgets help kids on the Spectrum pay attention, then perhaps they will help typical kids pay attention. Sadly many, if not most, children have successfully learned not to pay attention already and the last thing they need is another distraction. Parents and teachers often mistake the child looking in your general direction and apparently listening as attending. At best, we often mistake listening for paying attention. Listening is something you do when you’re watching your favorite sporting event and the game is tied with seconds to go and someone talks to you about the weather. Listening is something you do when you’re talking to someone on the phone while you’re checking your email. Ask the child who appears to be “listening” to repeat the last sentence of something you just said or read to them. When we talk about learning we are talking about changing the brain and to change the brain we need to put in specific appropriate input with sufficient frequency, intensity and duration. Of the three components, intensity is the most important. Intensity means focus and focus means that I have your undivided attention. We need to help teach children to focus and give undivided attention, otherwise parents and teachers are largely talking to themselves. If we want to be proactive and improve focus and attention, we need to do a better job of targeting the input to fit the child. Teaching algebra to a child who still is struggling with basic math isn’t going to work. Speaking in paragraphs to a child who has difficulty following a two- or three-step direction doesn’t work. Making many children sit in a chair and attend for more than ten minutes without letting them get up and move around a bit generally doesn’t work either. We need to pay attention to the individual and teach to their knowledge level so they have some context within which to associate the information. We need to be aware of the child’s processing ability (short –term and working memory) and target the structure of the input to fit them. We need to provide educational environments as free of extraneous distractions as possible—not contribute to them—and we need to focus upon the neurodevelopmental foundation and help build the child’s ability to learn, communicate and function. Many children across the county are learning not to attend, not be present and sadly are learning that learning itself isn’t fun, isn’t exciting and that it doesn’t work for them. This entry was posted in Challenging the Status Quo, Child Development, Education, Spontaneous Thoughts and tagged autism, autism spectrum disorder, behavior management, child development, fidget spinners, kids, learning, memory, parenting, processing, sequential processing, special needs, working memory on June 6, 2017 by Bob Doman. Light at the End of a Marathon | It Appears That... on It’s a Marathon – Part 2! Light at the End of a Marathon | It Appears That... on It’s a Marathon! It’s a Marathon – Part 2! | It Appears That... on It’s a Marathon!